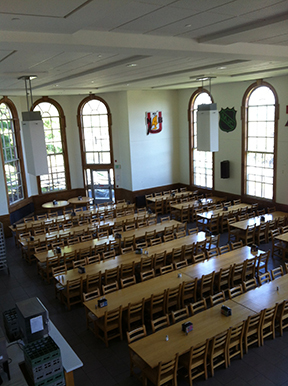 The most convenient and cost-effective accommodation for the 2014 GAC-MAC meeting is on campus. Consider staying on campus where you can be close to all of the sessions and events and enjoy our park-like surroundings and beautiful views of the city. Traditional residence includes shared washrooms. A single room has one twin bed and a double room has two twin beds. A suite includes a living room and private washroom and either two or three bedrooms. Each bedroom has one double bed. A number of centrally-located lecture halls will be used during the conference (see annotated map below). On-campus residences, summer hotel services, dining services, and the conference poster hall and exhibit hall are all short walk apart. 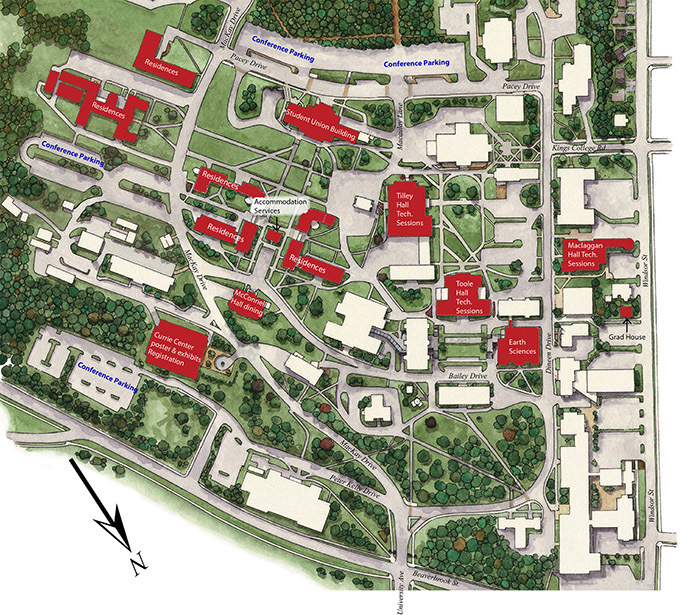 See the campus map (3.7M .pdf). Registration, posters and exhibitor booths will be housed in the Richard J. Currie Center. Conference delegates are advised to book their air travel as soon as possible. Fredericton Airport (YFC) is currently serviced by Air Canada with direct daily flights to and from Toronto Montreal, Ottawa, and Halifax. Saint John (1 hour drive) and Moncton (1.5 hour drive) are also serviced by WestJet. Fredericton is centrally located within a day drive from Boston (7 hr), Montreal (9 hr), and Halifax (4 hr). Conference parking permits will be available upon request. See the campus map for designated parking areas.